Chronic disease management is the biggest health care problem facing the United States today. Chronic diseases especially affect older adults, 80% of older adults have at least one chronic condition and 50% have two or more (CDC, 2007). The primary goal of chronic disease management is controlling disease rather than curing it. Early illness detection and recognition of small changes in health conditions are essential for early interventions when treatment is the most effective and when prevention of dramatic changes are still possible. Early illness recognition and early treatment is not only a key to improving health status with rapid recovery after an acute illness or exacerbation of a chronic illness, but also a key to reducing morbidity and mortality in older adults. Building on our current work using intelligent sensor systems to retrospectively measure functional ability in older adults, we propose to develop a prospective innovative technological approach to early illness detection and chronic disease management using inexpensive sensors embedded in the environment. Subjects will not use any expensive telehealth equipment or wear any devices. Instead, sensor data will be collected passively, thus eliminating compliance issues. In addition, the sensors monitor subjects continuously (motion sensors) while they go about daily activities in their homes. Unobtrusive bed sensors collect data about the subjects’ pulse, breathing, and restlessness while they sleep. We propose to use this information to detect changes in health status which could indicate an impending acute illness or exacerbation of chronic illness. Specifically, we propose to 1) develop an early illness sensor system that uses sensor data to detect early signs of illness or functional decline in older adults. We will further develop and refine a web-based interface to display sensor data in a format that health care providers find easy to use and interpret, readily available, and clinically relevant. 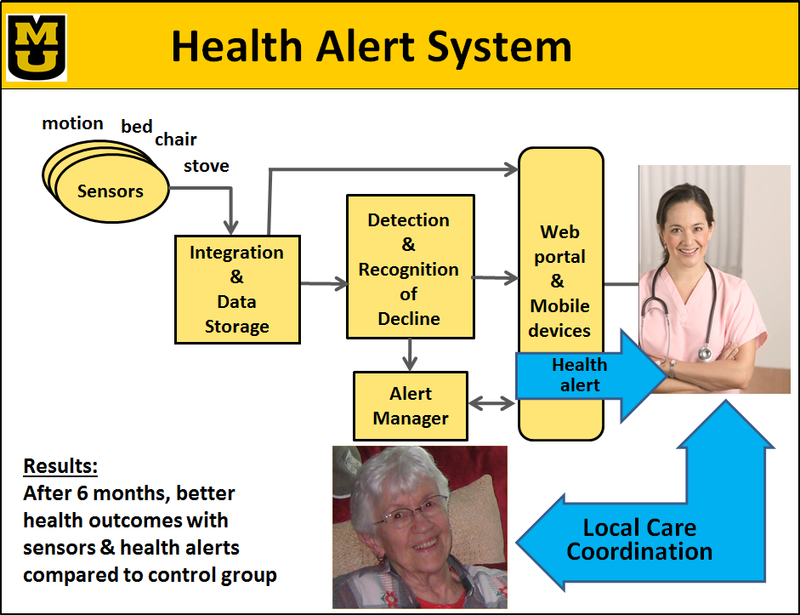 We will develop alerts based on the sensor data and notify health care providers of potential illness in older adults so they can further evaluate and intervene with early treatment of acute illness or exacerbation of chronic illness. Then, we will prospectively use the early illness sensor system in a pilot study to 2) determine the sample size for an intervention study using the early illness sensor system in elder housing to measure the clinical effectiveness and cost-effectiveness of using sensor data to detect early signs of illness or functional decline in older adults as compared to usual health assessment. Sensor networks were installed in TigerPlace apartments, using passive sensing for motion, bed, chair, and stove use. A web interface was developed to provide visualization of the in-home sensor data. A retrospective analysis was then conducted and, based on these results, early illness health alert algorithms were developed. A controlled study was run comparing 21 older adults with sensors and health alerts to 20 older adults receiving normal care only. Better outcomes were observed for the group with sensors and health alerts at 6 months, 9 months, and 12 months, relating to walking gait and hand grip strength. Data from the bed sensor was found to be instrumental in recognizing early signs of illness. Alexander G, Galambos C, Skubic M, Wang S, “Density Map Visualization as a Tool to Monitor Activity Levels of Older Adults,” Gerontechnology, Spring 2010; 9(2):186. Alexander GL, Rantz M, Skubic M, Koopman RJ, Phillips LJ, Guevara RD & Miller SJ, “Evolution of an Early Illness Warning System to Monitor Frail Elders in Independent Living,” Journal of Healthcare Engineering, 2(2): 259-286, 2011. Alexander GL, Wakefield BJ, Rantz M, Skubic M, Aud M, Erdelez S & Ghenaimi SA, “Passive Sensor Technology Interface to Assess Elder Activity in Independent Living,” Journal of Nursing Research, 2011, 60(5), 318-325. Rantz MJ, Skubic M, Koopman R, Phillips L, Alexander GL & Miller SJ, “Using Sensor Networks to Detect Urinary Tract Infections in Older Adults,” Proceedings, 13th IEEE International Conference on e-Health Networking, Application, & Services, Columbia, MO, June 13-15, 2011, pp 142-149. Wang S, Skubic M, Zhu Y & Galambos C, “Using Passive Sensing to Estimate Relative Energy Expenditure for Eldercare Monitoring,” Proceedings, IEEE International Conference on Pervasive Computing and Communications, Workshop on Smart Environments to Enhance Health Care, March 21-25, 2011, pp. 642-648. Popescu M & Mahnot A, “Early Illness Recognition in Older Adults Using In-Home Monitoring Sensors and Multiple Instance Learning,” Methods of Informatics in Medicine, 2012, 51(4):359-67. Skubic M, Guevara RD & Rantz M, “Testing Classifiers for Embedded Health Assessment,” Proceedings, International Conference on Smart Homes and Health Telematics, Artimino Italy, June 12-15, 2012, pp 198-205. Wang S, Skubic M & Zhu Y , “Activity Density Map Visualization and Dis-similarity Comparison for Eldercare Monitoring,” IEEE Journal of Biomedical and Health Informatics, 2012, 16(4):607-614. Skubic M, Rantz M, Miller S, Guevara RD, Koopman R, Alexander G, Phillips L, “Non-Wearable In-Home Sensing for Early Detection of Health Changes,” Quality of Life Technology for the Disabled and Elderly, R Schultz, ed. Boca Raton, FL: CRC Press, 2013, pp 227-244. Galambos C, Skubic M, Wang S & Rantz M, “Management of Dementia and Depression Utilizing In-Home Passive Sensor Data,” Gerontechnology, 2013, 11(3):457-468. Skubic M, Guevara RD & Rantz M, “Automated Health Alerts Using In-Home Sensor Data for Embedded Health Assessment,” IEEE Journal of Translational Engineering in Health and Medicine, 2015, 3:1-11.